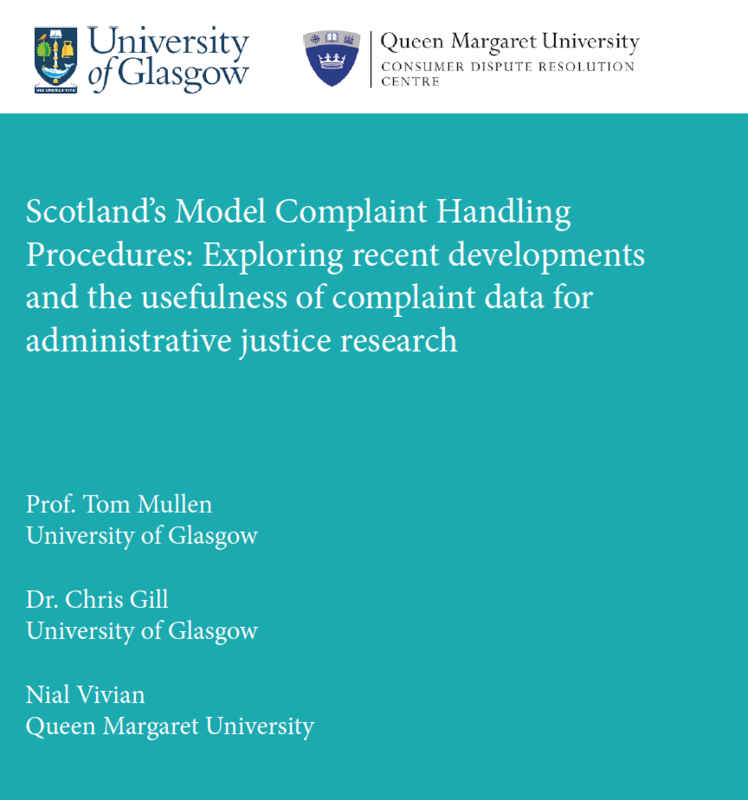 Tom Mullen, Chris Gill, and Nial Vivian have published a report of their research into Scotland’s new arrangements for public service complaint handling. The research was funded by the UK Administrative Justice Institute (UKAJI) and the Nuffield Foundation. The report is being formally launched today at a UKAJI Workshop, held at the University of Glasgow, which will be attended by academics, practitioners and policymakers interests in administrative justice issues. The aim of this research was to explore Scotland’s new system for local authority complaint handling. Following the Public Services Reform (Scotland) Act 2010, the Scottish Public Services Ombudsman (SPSO) was tasked with simplifying and standardising complaint procedures across the Scottish public sector. To do so, it created an internal team called the Complaints Standards Authority (CSA). The CSA’s role involves designing model complaint handling procedures (model CHPs), monitoring the operation of those procedures (including setting data reporting requirements), and supporting the development of good practice in complaint handling. draw lessons for wider administrative justice policy based on early experiences of this new approach in Scotland. The rest of this post outlines our key findings in relation to each aim. The new model CHP has been implemented across Scotland, and stakeholders directly involved in the process are unanimous that this has been a success. Key benefits identified by interviewees were improvements in simplicity and speed for complainants and the beginnings of a more positive culture around complaints in local authorities. The publication of complaints data was seen by most interviewees as focusing minds on complaints and providing opportunities for learning. The key challenges in relation to the new system related to inconsistency between authorities in collecting data, how complaint data should be interpreted, and how performance indicators around complainant satisfaction and learning from complaints should be reported against. The data now being published represent a significant enhancement in the evidence available to researchers to make evaluations of the public service complaint system in Scotland. Previously, little was known about the volume, timeliness, outcomes, user satisfaction, and learning from complaints in local authorities. While this information is useful, issues around data categorisation and inconsistent recording practices provide some limits on interpreting the data. In addition, there would be significant benefit to researchers in additional data being collected, for example, around the demographic characteristics of complainants and about the types of issues that are being subjected to complaint. Greater standardisation and central publication of data would also facilitate the use of complaint data in future research. The SPSO’s new role represents a significant development: while not constituting the regulation of complaint handling, the standard setting and monitoring role the ombuds performs in relation to complaints is a clear move away from an ombuds’ classic complaint handling function. This research study – although it does not constitute an evaluation of the new approach and is very much exploratory in nature –provides some initial support for the benefits of the SPSO’s enhanced ombuds model. While there is potential in the new approach, there are some questions about whether the approach would be effective in a larger jurisdiction than Scotland. Nonetheless, the Scottish experience is at least relevant to current legislative proposals in Wales and on a UK wide basis (see the Public Service Ombudsman (Wales) Bill and the draft Public Service Ombudsman Bill). On a wider basis, the SPSO’s new role raises interesting questions for administrative justice policy in relation to the external monitoring of internal grievance procedures, the role of the ombuds within the administrative justice system, and the opportunities to take more strategic approaches to learning from complaints. The report includes a number of recommendations for policymakers, practitioners, and researchers. The hope is that this project will be followed up in future research and generate greater understanding of internal complaints procedures, which have traditionally been one of the least well researched aspects of the administrative justice system. The authors also hope that greater attention will be paid to the production and publication of administrative justice data, with a view to improving the information available to research and other stakeholders. Tom Mullen is Professor of Law at the University of Glasgow; Chris Gill is Lecturer in Public Lat at the University of Glasgow; Nial Vivian is a Lecturer in Dispute Resolution at Queen Margaret University.